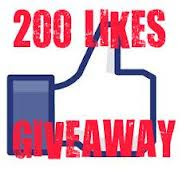 Angelena Marie Fit: 200 Facebook Likes Giveaway! Now that On Fire Fitness Healthy Living has reached 200 Likes on Facebook I decided to do a giveaway to one lucky winner! You will be entered to win a $25 Vitamin Shoppe Gift Card and 2 weeks of personalized workouts OR meal plans (winner may choose option)! Fill out the entry form listed at the top of On Fire Fitness Healthy Living page. *In order to qualify you must 'like' On Fire Fitness Healthy Living and sign up for the newsletter. Both of these steps must be done in the giveaway form. Also, make sure to verify your subscription after you enter, you will receive an e-mail to confirm. This step must be done. *I will contact winner on 9/16/13 and this winner must get back with me no later than 9/18/13 or another winner will be chosen. Thank you so much for your support and Good Luck!